The first US cardiac catheterisation procedure using the TactiCath force-sensing ablation catheter (Endosense) for the treatment of symptomatic paroxysmal atrial fibrillation was recently performed by The Mount Sinai Medical Center, New York, USA. The first catheter ablation procedure was performed at the end of February by Vivek Y. Reddy, director of the Cardiac Arrhythmia Service at Mount Sinai Heart, and colleagues, Andre d’Avila, co-director of the Cardiac Arrhythmia Service, and Srinivas Dukkipati, director of the Experimental Electrophysiology Laboratory. Reddy is the national principal investigator on TOCCASTAR (TactiCath Contact Force Ablation Catheter Study for Atrial Fibrillation) trial, which main objective is to explore the use of TactiCath for patients who have symptomatic paroxysmal atrial fibrillation and who are resistant or intolerant to at least one anti-arrhythmic drug. The TactiCath force-sensing ablation catheter allows physicians to control how much force is required to create lesions during ablation procedures. 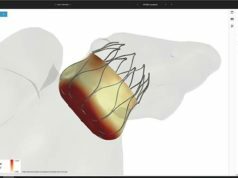 This generates a delicate balancing act between procedure effectiveness and safety, as too little force may render the procedure ineffective and too much force can perforate the heart wall. The TactiCath is the first force-sensing ablation catheter to give physicians a real-time, objective measure of tip-to-tissue contact force during the catheter ablation procedure using fiber optic sensor technology. Based on validated sensor technology, it provides highly accurate and sensitive measurements at the catheter tip. A growing body of evidence has reinforced the value of force sensing in improving patient outcomes of catheter ablation procedures and has supported the TactiCath’s potential to improve the effectiveness, safety and accessibility of catheter ablation treatment of cardiac rhythm disorders. Patients enrolled in TOCCASTAR will be randomly assigned to receive treatment with either the TactiCath or an alternative FDA-cleared device and will be followed for 12 months by study physicians. Results of TOCCASTAR will be used to support a Premarket Approval Application FDA for clearance of the TactiCath catheter and accompanying TactiSys system. Reddy and his colleagues have long been leaders in the field, being the first in the United States or the world to use a number of novel technologies including: the cryoballoon ablation catheter, the visually-guided laser balloon ablation catheter, and the first to perform robotically-guided navigation of ablation catheters for atrial fibrillation ablation.